The flamboyantly-colored mosquito pictured here is known as Sabethes cyaneus, and is a natural inhabitant of the Panamanian forest canopy. This particular specimen was an offspring of a colony of mosquitoes that had been raised in captivity at Ohio State University, and in its larval form, had been sent to the Centers for Disease Control and Prevention (CDC), where it hatched, and was subsequently photographed. Note its brilliant iridescent purple, blue and gold coloration, as well as the large, feather-shaped mass of setae adorning the tibiae of its middle pair of jointed legs. See PHIL 20514, for another view of this mosquito, which had landed on the photographer's hand. The medical importance of some Sabethes spp. mosquitoes lies in their ability to play the role of a yellow fever vector. 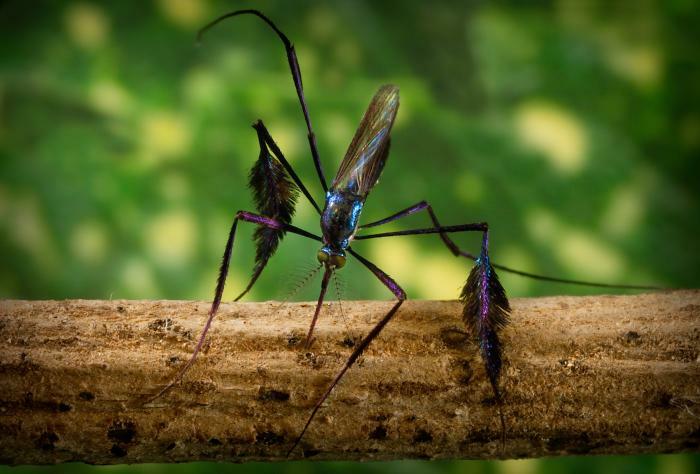 Like many other forest mosquito species, these too undergo their early developmental evolution as eggs, larvae, and pupae, in water that has collected in tree holes.